ATL Internals by Brent Rector and Chris Sells. Beginning Atl Com Programming by Richard Grimes, Alex Stockton, George Reilly, Julian Templeman. Inside Distributed COM by Guy and Henry Eddon. Essential COM by Don Box. Effective COM: 50 Ways to Improve Your COM and MTS-based Applications by on Box, Keith Brown, Tim Ewald, Chris Sells. 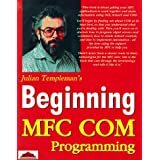 Beginning MFC COM Programming* by Julian Templeman. Professional DCOM Programming by Richard Grimes. ActiveX Controls Inside Out by Adam Denning. OLE Automation Programmer’s Reference: Creating Programmable 32-Bit Applications by Microsoft Press. Inside OLE 2nd Edition by Kraig Brockschmidt. This is a must read from page 1 to the end. Hi, Neat post. There’s a problem together with your web site in web explorer, would test this? IE still is the marketplace leader and a good section of other people will omit your wonderful writing because of this problem. I’ve tested this site with Chrome and IE 10. Could you please let me know what is wrong and with which browser? Wonderful web site. Plenty of helpful info here. I’m sending it to some friends ans also sharing in delicious. And obviously, thanks to your effort!